BRYAN EATON/Staff photo. Lt. Gov. 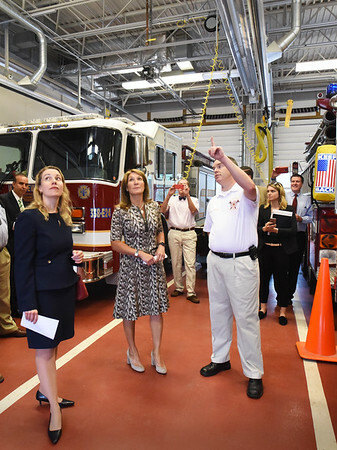 Polito, center, joined Department of Energy Resources Commissioner Judith Judson, Rep. Leonard Mirra and state and local officials to tour West Newbury’s Public Safety Facility and learn about the projects made possible as part of the town’s participation in the Department of Energy Resources Green Communities Program. West Newbury has received a total of $274,054 to fund clean energy and energy efficiency projects in town facilities. Here, volunteer fire chief Michael Dwyer shows flourescent lights that are yet to be converted to LED.